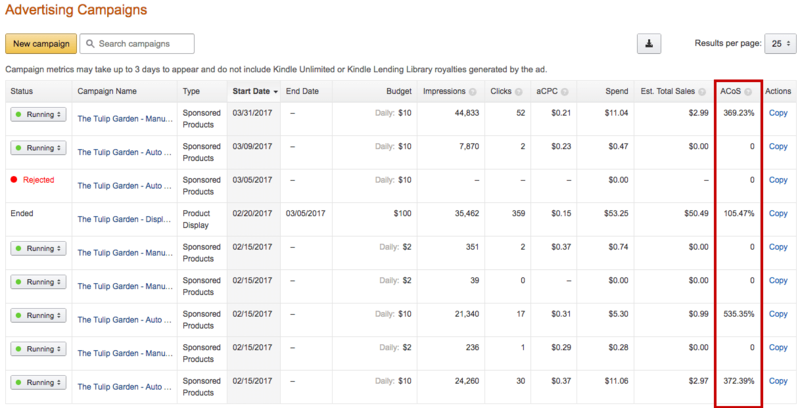 Amazon ads have been the talk of indie author town since Amazon opened its AMS platform to all KDP users in 2016. 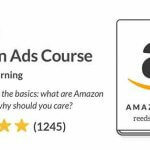 While Facebook ads become increasingly competitive, as Mark Dawson already predicted on this blog back in 2015, Amazon has made huge improvements to their advertising platform, and are progressively becoming one of the most favored channels for marketing a book. Like any other advertising platform, the AMS platform comes with its own challenges and learning curve. And like any other platform, success largely depends on data analysis and iteration. In this post, we’ll analyze two case studies (one fiction, one nonfiction) and try to understand what these authors are doing right. 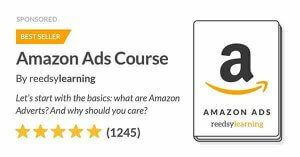 Before we get into the case studies, it’s important to have a look at what Amazon ads do. 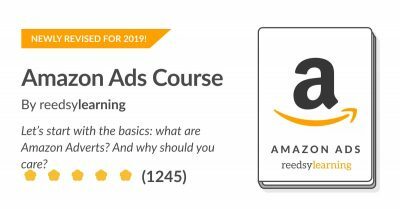 If you’re already familiar with them — or have taken the Reedsy Learning course on Amazon ads for authors, or Dave Chesson's video training — you can skip this part. Placement: where do the ads show up? Targeting: how can I decide whom the ads get shown to? Cost: when am I being charged? What is the minimum I need to invest? 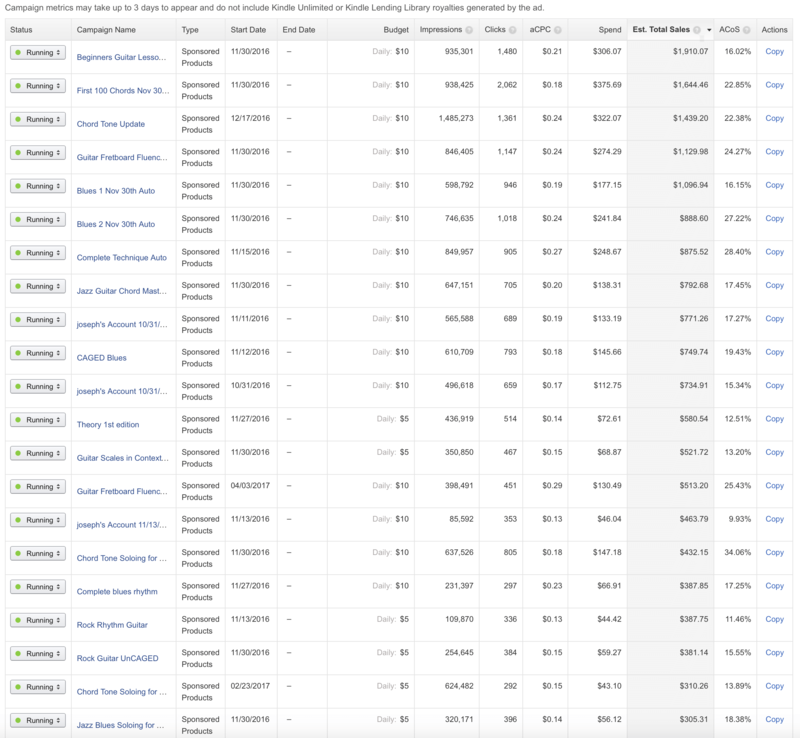 Analytics: how do I know if my ads are working or not? Sponsored Product: these ads show up on search result listings and other books’ product pages (below the “also boughts”). Product Display: these ads show up right next to the book description on a product page, and on the Kindle homescreen and screensaver. Automatic targeting: you let Amazon choose where to display your ad. Manual targeting: you choose keywords and Amazon will run your ad when people search for those keywords. 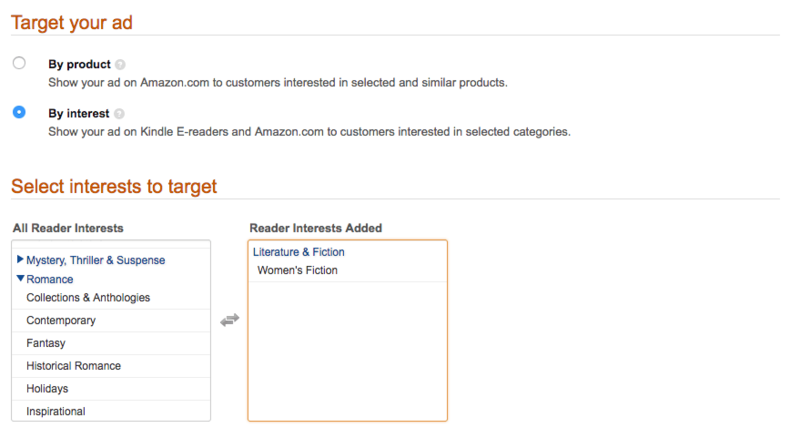 There are also two targeting options for Product Display ads: either by interest, or by product. “Interest” is pretty simple. You just select one or several Amazon categories or subcategories. However, with “product” you can have more fun! You can select which exact titles you want your ad to show up for. Do so by searching for them by name, by genre, or by ASIN (Amazon identification number). While Facebook generally charges you per 1000 impressions, on AMS you only pay when you get a click. This means that if your advert is shown to 20,000 people, and no one clicks on it, you won’t be charged a thing. 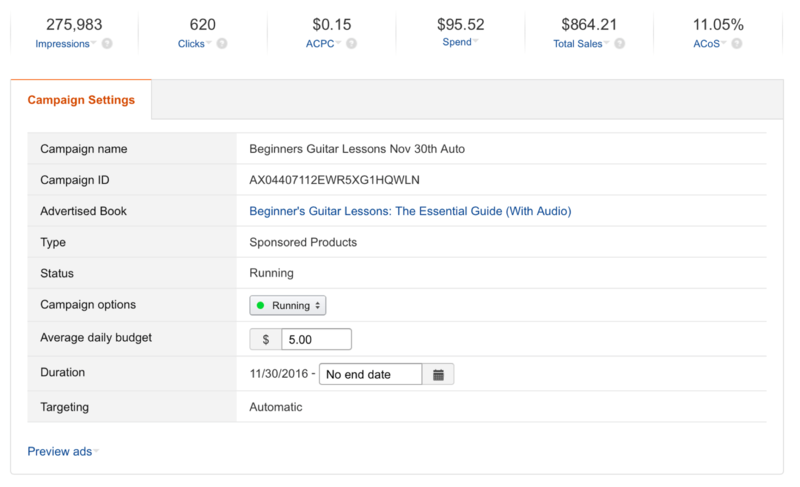 For Sponsored Product ads, you can start advertising for as low as $2 a day. For Product Display ads, you need to set up a “lifetime cost” per campaign (the minimum is $100). Note: these are budgets only. It is extremely likely that Amazon will actually only spend less than 50% of the budget you put in. Amazon’s AMS dashboard is fairly simple (too simple, even). 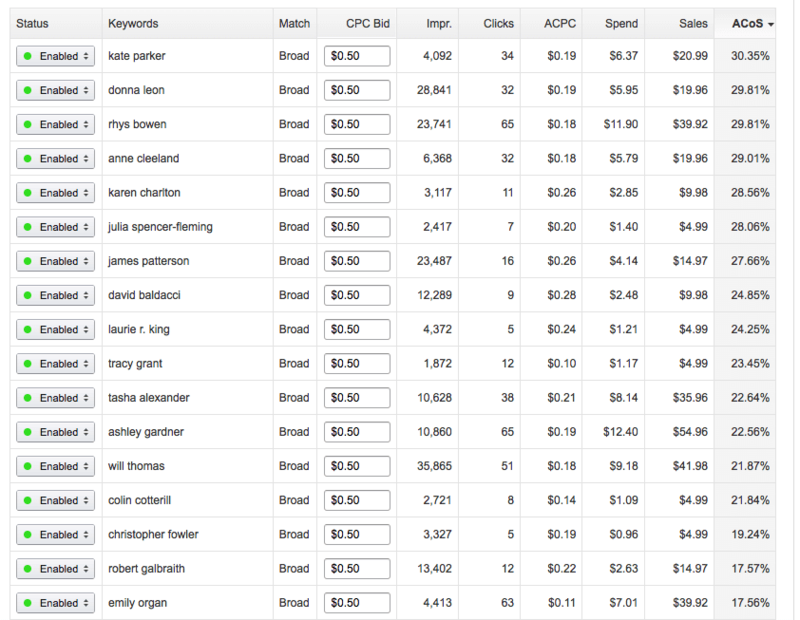 It shows your campaign’s budget, ad spent, impressions, clicks, cost-per-click, sales, and crucially, the ACoS. “What the hell is an ACoS?” Good question. It’s an acronym you don’t come ACroSs (hehe) on platforms like Facebook Manager or Adwords. It stands for “Advertising Cost of Sale," and it’s a ratio that measures the amount you spent on the campaign relative to the sales you earned directly related to that campaign. Basically, ACoS = Spend / Sales. It’s a wonderful little metric that tells you, at a glance, whether your campaign is making or losing you money. Note that sales are calculated by Amazon based on the retail price of your book, not your royalties. If your book is priced below $2.99 or above $9.99, you’re earning 35% royalties, so you’re only making money if ACoS < 35%. All in all, Amazon Marketing Services offers a relatively straightforward platform with clear reporting. Its main advantage, though, is that it lets you advertise your books in a place where readers are actually searching for and looking to purchase books. Which is exactly why these two authors gave it a try. Let’s dive into their case studies! Annelie Wendeberg is an award-winning author of historical and climate fiction, and has been using AMS ads on three of her books in the past few months: The Devil’s Grin (Victorian mystery/thriller), Keeper of Pleas (Victorian mystery / police procedural), and 1/2986 (Climate Fiction / Hard Science Fiction). All three are the first books in their respective series. Here’s a first pointer for you series authors: advertising the first book in the series means that the readers you’ll acquire through the ads can then purchase and make their way through the rest of their series. “I try to find authors and books that are similar to me and my books, and then I test those keywords. Anything that performs well is then again tested for similar keywords. And so on." You’ll probably find that you need to test a lot of keywords before you find some that really work for you. A good way to find more keywords is to go through your book’s “also boughts," and then those books' “also boughts," and so on. If a keyword gets too few clicks/purchases after 3,000+ impressions, pause it. Joseph Alexander started writing books about guitar five years ago (in 2012), and in that time has gone from being ‘just one guy writing books’ to becoming a small company that turns over around $500,000 a year. Let’s see his current results and then look at a few specific examples. The first thing to notice is that he too has 100% gone with sponsored products. Next, let’s take a look at the average daily spend. Now, remember what we were saying about being charged only per click? If you look at the third line in his dashboard, it's not the one making him the most money, but it's driven 1.5M impressions so far. In terms of brand awareness, that's pretty "impressive", eh? The main thing to note is that his targeting is automatic. 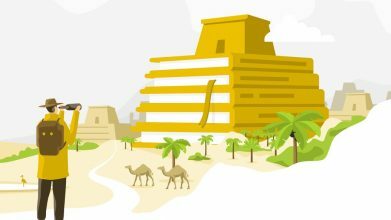 For more insights into Joseph’s campaigns, take our free course on Amazon ads! Two of the 10 lessons are written by him and he shares everything about his process. 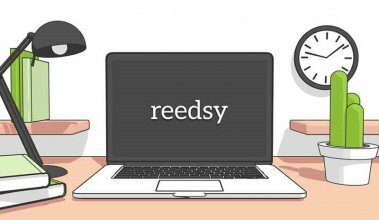 On top of that, Joseph's a freelance book marketer on Reedsy. 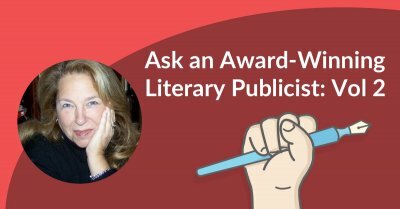 If you’re a non-fiction author looking to self-publish or to dabble with AMS ads, you can get in touch with him and seek his help. Even if the ACoS isn't the best, consider the number of impressions you're getting and the impact in brand awareness. What's your experience with the AMS ad platform been like? Share your insights with us below. If you have any questions for Annelie and Joseph, feel free to ask in the comments as well! Learn ways to master one of the web's most powerful ad platforms with this free 10-day course. 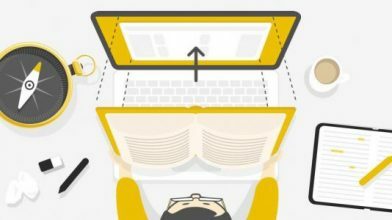 You can tap into Amazon's book-hungry audience to acquire new readers for as little as $2 a day. I haven't been successful with Amazon ads, yet. But after reading this I'm definitely going to add similar authors to my keywords, optimize my cover copy and try automatic targeting. Thanks for the tips! Glad the tips were helpful! I've found you need to add *a lot* of keywords to start finding some that work. In the course, I list some of the places I've used (recommended by Mark Dawson) to find keywords, and how to go about adding them to campaigns and monitoring. Excellent, thanks! I've enrolled in the class and am looking forward to learning where to find more keywords. One correction - paperbacks absolutely are included in the estimated sales and ACoS. I know many authors who have definitively seen them show up associated with an ad 1-3 days after the sale shows on Createspace or KDP, including myself. Audiobooks, no, those don't appear to be included. - Ranking boosts as a result of increased sales. I was enjoying my experience with AMS until recently. All my campaigns thus far have been product displays targeted by interest. I've run them a month at a time and was getting ~30,000 to 50,000 impressions. Previous to my current campaign, I copied a previously successful campaign and it only received ~8,000 impressions. I queried AMS about that and they simply said, "Don't know why we aren't showing your ad, our system is working." I gave the advertising a break for a bit and then reran the campaign. Kindle rejected the ad copy - same ad copy they had approved of previously. I questioned them as to why, they ran it up the chain and finally approved it before campaign launch. The campaign is running now and in six days has not been shown once on Amazon or Kindle (zero impressions). My bid offering was slightly above the average. Beginning to have my doubts about the entire thing. I just want to know if I use createspace to publish my book with paperback version only. 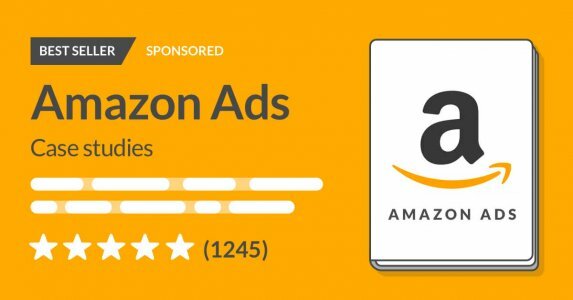 Can i use amazon ads to advertise just paperback book ? What's your reason for not wanting an ebook edition? 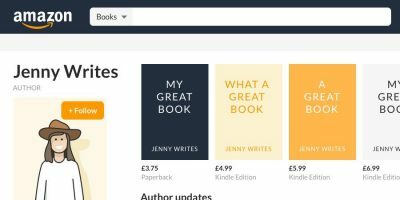 If you use just Createspace to publish a paperback, you won't have a KDP account and therefore not have access to AMS. One of the problems you have with amazon ads is the marketing stats you get. If you ever advertised with Google Adwords you know what I am mean. The table data you get is accumulated and without downloading the campaign stats every day you are out of luck figuring out how to improve your ad performance and get a better ACoS. I started to make screenshots to compare two days and get my daily stats. After that, I decided to brush up my programming skills and created some nice charts. This helped me to improve my ads, finally turn a profit, and I am happy to announce that this tool is now available for other authors as well. 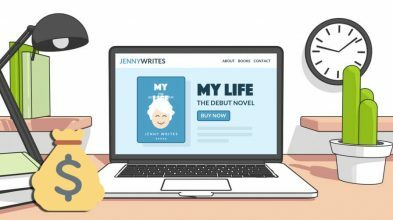 What is the Cost of a Professional Author Website? KDP Select vs. "Going Wide" — Which Option is Right For You? Enroll on this free 10-day marketing course.